Baudelaire was right at the time, and indeed, you could say the same thing of Paris today. It never stops changing. Just as you cannot step into the same river twice, you cannot set foot in the same city twice. Ask any visitor who has gone on a futile quest to find “that wonderful little restaurant / hotel / shop / patisserie we discovered on our honeymoon / student year abroad / first visit / previous visit.” We’ve all done it, and we’ve usually ended up looking sadly at the space it once occupied, now a laudromat / modern high-rise / government office / vacant lot. On this past summer’s visit to Paris, however, we noticed a pattern to the disappearances. It started on the first day, when we passed the Livre Sterling on the avenue Franklin Roosevelt, an idiosyncratic bookshop we have written about in a previous blog. This time, the tables outside advertised books on sale and the shelves inside were almost empty. It was going out of business. Perhaps it wasn’t an ideal location for a bookshop, but it was the only one in the area, and now it has gone. 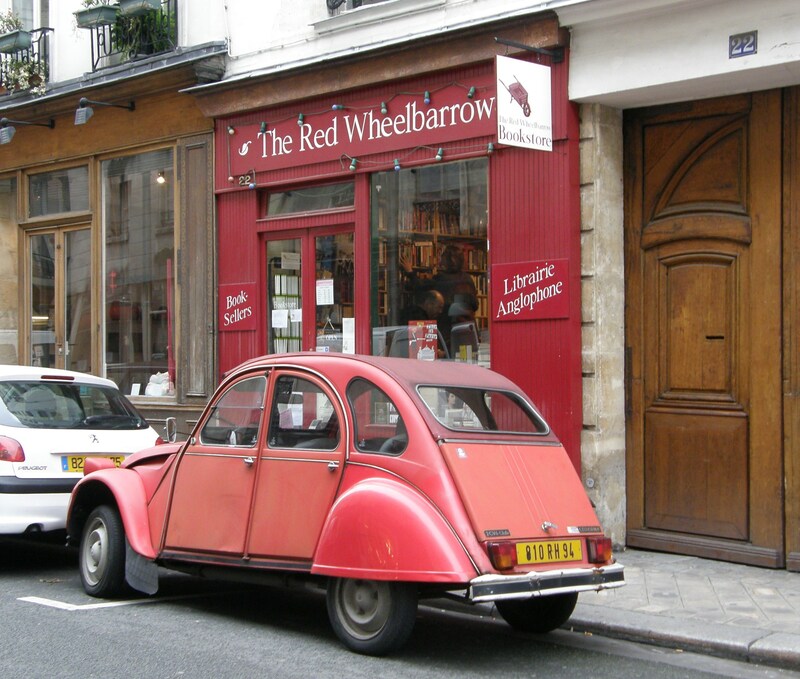 We already knew about the demise of our favourite English-language bookshop – the Red Wheelbarrow on the rue St-Paul in the Marais. Here it is as we remember it. The owner had had to move away for personal reasons, and had been unable to find a buyer to take over the business. So the books were sold and the place closed. The sign remained for a long time after the shop went dark. 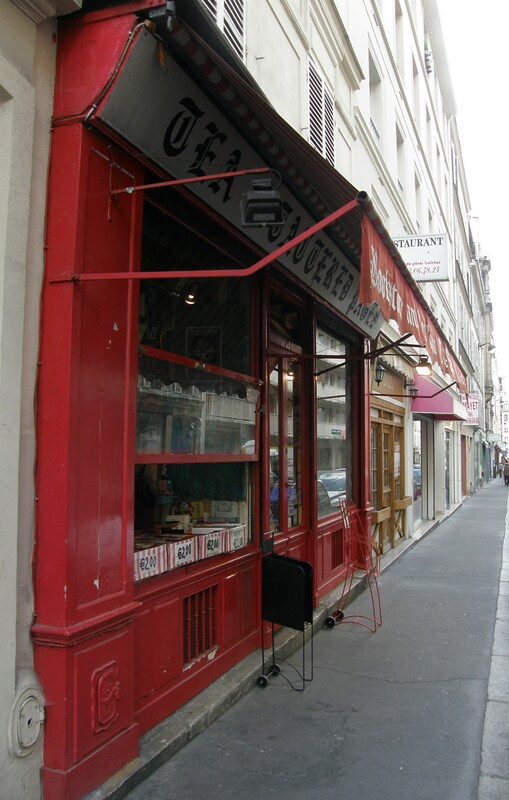 What threw us completely was the disappearance of another Marais book and paper store – the Librairie Charlemagne on the rue St-Antoine, which had closed a year earlier. How had we missed that? We’d bought books, maps, gifts, stationery in that store countless times over the years. It had vanished so completely that I had to ask in a nearby store if I had got the address wrong. No, a young woman told me, it had closed and been replaced by a clothes shop. By a curious quirk of Google Street View, the view of the bookshop is split between 2008 and 2012. I have spliced the two together here with a red line to show the overlap: on the right is the bookshop when it was still a going concern. On the left is the same entrance again and the rest of the facade with signs advertising the going-out-of-business sale. 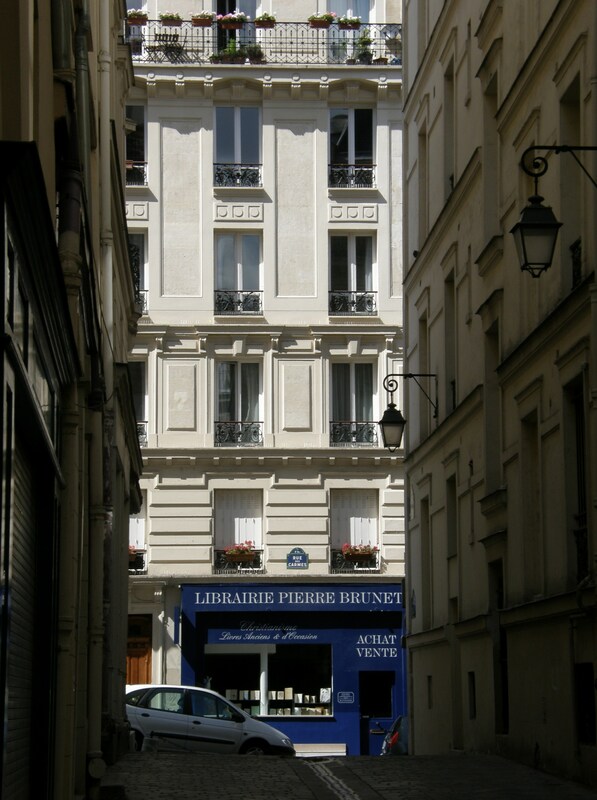 I wonder if the little statue still graces the corner of the rue St-Antoine and the rue de Sévigné. 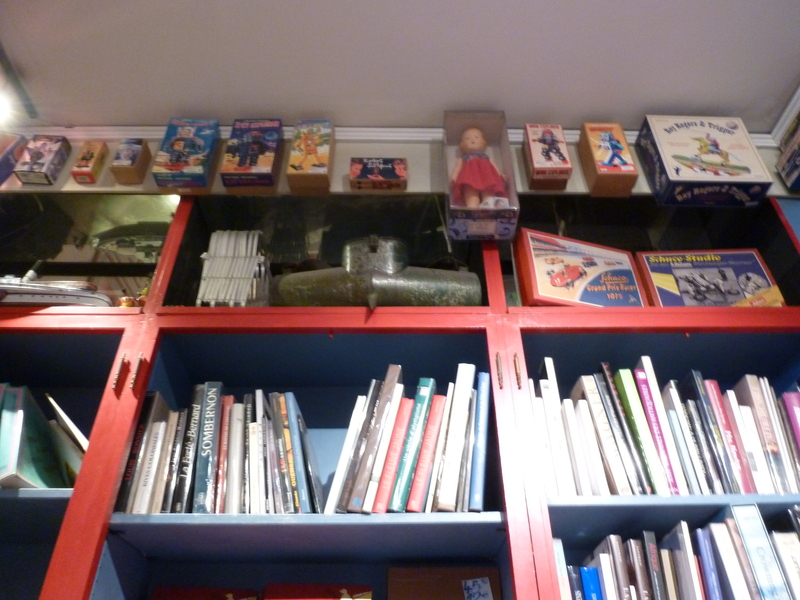 We wandered over to Mona Lisait nearby (a chain that sells secondhand and remaindered books). The branch in the Marais occupies an odd, interim space that seems to have been a cobbled lane at one point. 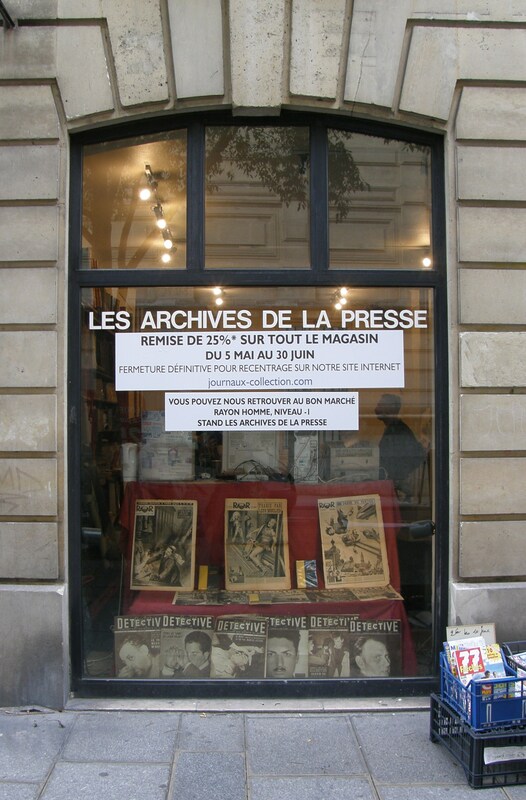 Norman then suggested we have a look for the Archives de la Presse, a place selling old magazines and advertisements, where we had often rummaged for materials related to our research. Of course, we couldn’t exactly remember the name, but we described what we wanted to the man behind the counter at Mona Lisait, and he gave us some generalized directions. We set off and after a few wrong turns, arrived in front of the shop. As we watched, burly guys carried out boxes of books and magazines and put them in a truck. The shop was closing, although it will continue selling old magazines and newspapers online and maintaining a small stand in the Bon Marché. They even have a Facebook page. Score one for the Internet. Tea and Tattered Pages in Montparnasse closed earlier this year when its proprietor died. Her daughters are searching for someone to carry on the business, which even at best seemed like the triumph of hope over experience. We can remember eating a modest lunch with a friend in the back room, surrounded by books, and the proprietor at one point asked us to keep an eye on things while she popped out to get a carton of milk for our tea. Oh, there are still plenty of bookshops in town. There are still bouquinistes, and we even saw a display of prototypes of modernized bouquiniste stands on display near the Hotel de Ville last December. But the form of the city is changing, and its independent bookshops are dwindling, despite efforts by the government to prop them up. Well, the cathedral is still standing, but it is filled mainly with tourists and their colourful guidebooks rather than worshippers taking spiritual nourishment from its carvings and stained glass windows. Those who do look for guidance may seek it in solitude from a book, and not from a huge religious building and the community associated with it. I suppose that is what the archdeacon meant. Now the book is changing and the city is changing with it. It’s not that people aren’t reading. 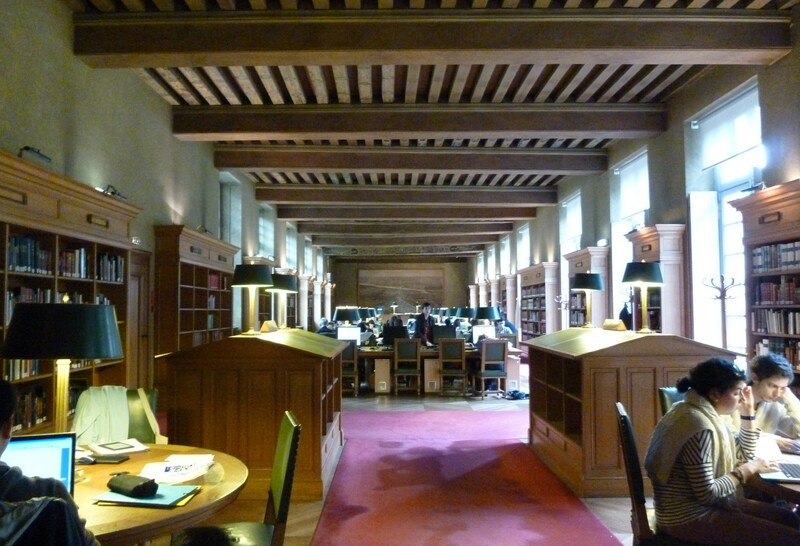 The big libraries are full of scholars, although they are often staring at laptops and tablet computers rather than actual books. Books are objects, like typewriters, that once performed a function. And for many people, the function can be performed in other ways, through other media. 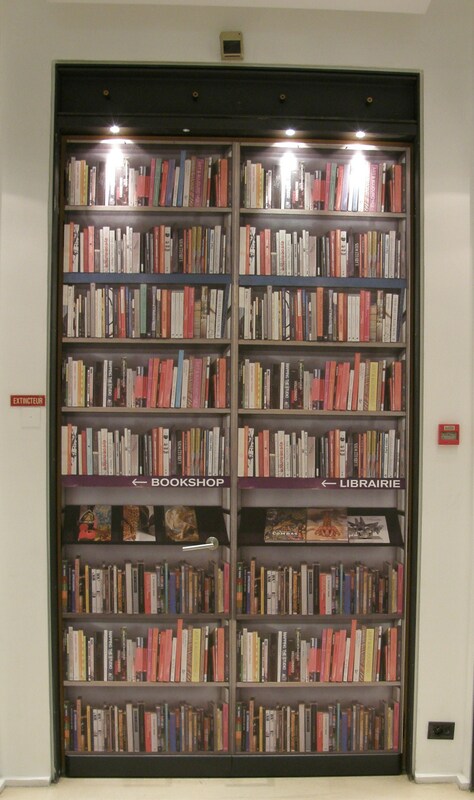 But bookshops have a function too. They were never just about selling books. They hosted readings and launches, and they were places to go for conversation and news. At the Red Wheelbarrow, the people behind the desk recommended not just books, but the best boulangerie in the area. The staff weighed in on the merits of local cafés, and introduced us to other browsers crowding into the tiny space. You can’t get that on an e-book. In Paris, where sometimes it can be hard to find one’s feet and where much is unfamiliar, a space like the Red Wheelbarrow allowed us to feel on solid ground. Lost bookshops are lost friends. When a place like that disappears, it is not just the end of a business, it is the end of a friendship. Text by Philippa Campsie, photographs by Norman Ball. 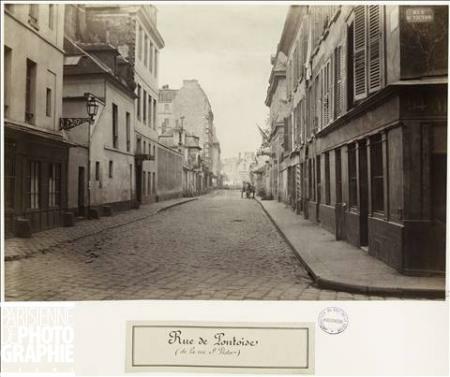 Photograph of the rue Pontoise by Charles Marville from Paris en Images. *L’archidiacre considéra quelque temps en silence le gigantesque édifice, puis étendant avec un soupir sa main droite vers le livre imprimé qui était ouvert sur sa table et sa main gauche vers Notre-Dame, et promenant un triste regard du livre à l’église : Hélas ! dit-il, ceci tuera cela. This entry was posted in Paris bookstores, Paris shops and tagged Archives de la Presse, Artcurial, bouquinistes, Charles Baudelaire, Emmanuel Delhomme, Georges-Eugène Haussmann, Librairie Charlemagne, Librairie Pierre Brunet, Livre Sterling, Mona Lisait, Napoleon III, Notre Dame de Paris, Red Wheelbarrow, Tea and Tattered Pages, Victor Hugo. Bookmark the permalink. I like that the bookstore owners think they can take care of the problem themselves. Sounds so confident. Not that I believe it. If we had a cultural minister in the U.S. I imagine s/he would declare bookstores elitist and obsolete. Agreed. I certainly would not argue they are elitist. 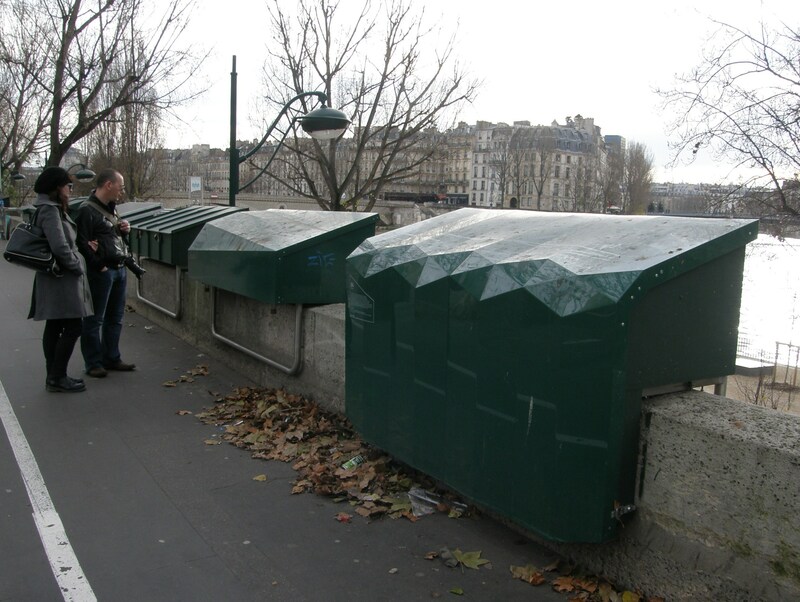 Thanks for this interesting post on a sad state of affairs in Paris as in many other cities. Sounds like Norman’s six-year-old grandson. Bright as a button, speaks two languages already, but as for reading…why bother, when you can watch videos instead? You have to wonder…if we’d had such devices at that age, would we have invested the time and effort to learn to read? Back then (way back when), reading was our access to magic and other worlds and secret lives, so of course we wanted to do it. Like most kids of our generation, we read under the covers with flashlights after lights out. Today, kids probably feel the same way about the moving pictures on their portable screens. Who can blame them? They are too young to know what they are missing. I really noticed a decline in the number of people I saw reading on the Metro in Paris and on trains in France generally this year. We’ve visited annually for 9 years now, and I’ve always been impressed by the presence of readers, but more and more were busy with smartphones this time. Purely impressionistic, anecdotal “evidence” but it worried this fan of books and lover of Paris. . . I think you are right. There are certainly fewer readers on the Paris Metro and SNCF. As so many other options become possible (in Toronto, I see people playing video games and watching movies on their handheld devices), reading gets squeezed out. We seem to be returning to a time in which reading was the activity of a minority of people, not a universal practice. Publication for the masses was the phenomenon of only a few decades in the 20th century. But it was one of the best and brightest achievements of that century. You are my virtual look to the city I have always wanted to visit 🙂 Thank you. Having grown up loving books, not just the reading, but the physical properties of books, I too am saddened by the decline in the number of quaint book stores. When I entered Cranbrook Academy of Art in 1969 the printmaking department had a compete linotype “library”, letterpresses and paper-making facilities. My second year, all of that was removed to “modernize” the studio for stone and plate lithography. There was a boom in printmaking for artists. Then it became offset printing though computers. I can make a book now on my computer and then bind it by hand. But it just isn’t the same. These changes are not too different from the time the printing press was invented and hand lettered and hand painted books became obsolete. People from the age of 50 and beyond can see many things from their youth disappear. As change occurs exponentially it will soon be noticed as people reach 40……. perhaps it already does. 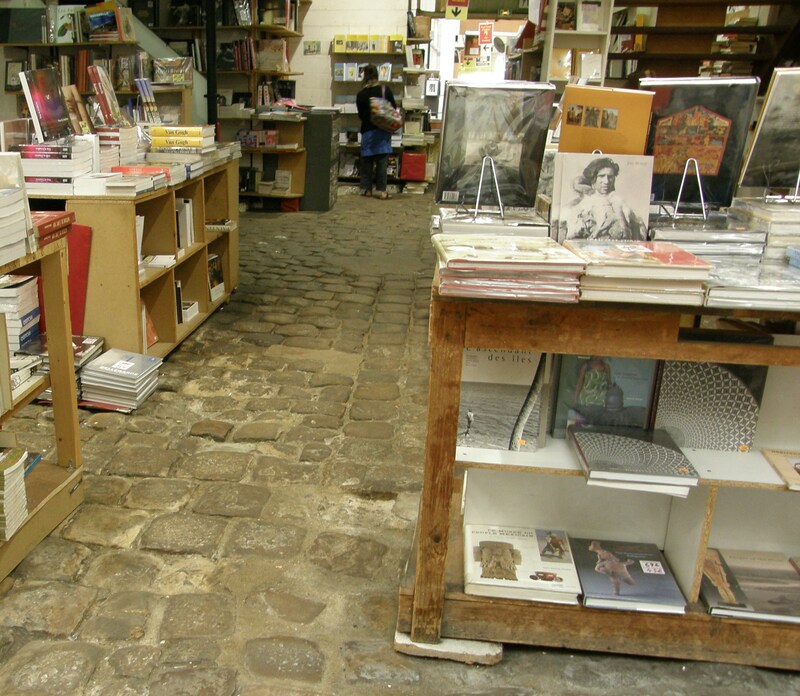 The loss of these lovely bookstores is so much more than the loss of the value of books, which is monumental, but is symbolic of a deeper loss… For me changes in Paris are akin to sacrilege. I realize the bottom line is money but I am so disappointed and literally horrified that the French govenment has not been able to do more to preserve Paris. Just an update on bookstores. I’m going to Paris on Friday and planned to go to the Mona Lisait, only to find on line that it, too, has now closed. The independent bookstores that seem to be thriving (anywhere) are the ones that have an active community of writers and readers, and a plethora of events. . . such as Shakespeare and Company (Paris) and Book Passage (San Francisco in USA). I went to Shakespeare and Company (in NYC) last month, only to find that it was its last day. Apparently a running shoe store is taking its place. So sad! The Red Wheelbarrow has reopened in a new location on rue de Médicis.